Instagram has been spotted testing a new feature on its mobile app. With the new feature, users can see the online status for people that they been conversing with on DMs (Direct Messages). Interestingly, the feature works even if the person is not following your account. Gadgets 360 spotted this feature, along with other users on Twitter who have been pointing out the sudden rollout. Online reports have also suggested that Instagram is testing out other features such as text-only stories and alerts for screenshots. 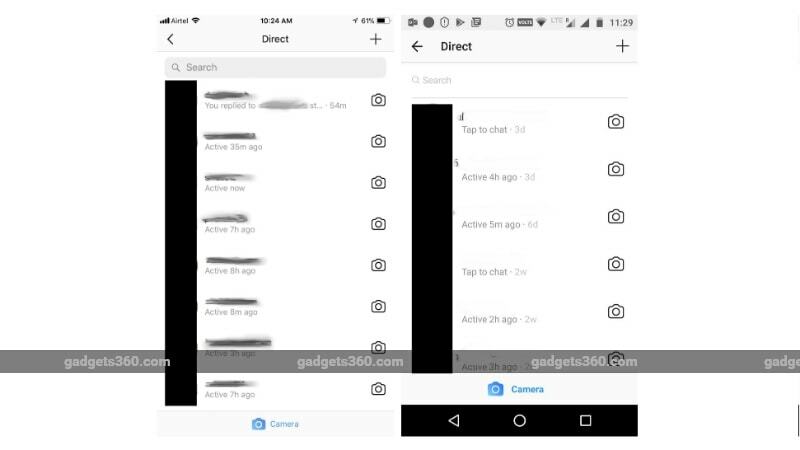 As we mentioned, Instagram has been spotted testing a new feature that is similar to ‘Last Seen’ on WhatsApp and ‘Active at’ on Facebook Messenger. It can be accessed by going into the Instagram Direct messages section of the app. It shows the last time stamp when the user was online on the app; it has options like ‘Active now’, ‘Active today’, ‘Active 1h ago’, ‘Active 24m ago’ etc. We have learnt that the feature is currently available only for a few select users, albeit on both Android and iOS. Twitter users have also reported seeing this feature on their app. We have contacted Instagram for a comment on an official rollout. Apart from that, TheNextWeb reports that Facebook-owned Instagram is testing a new ‘Type’ feature that enables text-only, written stories on the mobile app. While Instagram Stories have always been based on images and video, Instagram has been testing the new Type feature that apparently shows up next to other choices such as Boomerang, Rewind, and Superzoom. According to the report, users can choose from different fonts, different backgrounds, and even apply filters on Type. Another report from WABetaInfo suggests Instagram is testing out a security feature on its app. The feature will send notifications to users if someone takes a screenshot of their stories. Instagram currently notifies users of a screenshot only if the image or video is sent on Instagram Direct. Now, like Snapchat, the feature will be expanded to public stories as well.